9 Poor movies- Slumdog Millionaire Best Oscar Picture? When I put these points to cinema lovers they mention the ‘cinema experience’. But the visual and aural experience at home is moving towards matching the cinema. The levels of suspension of disbelief are similar. I’ve never really bought the ‘social’ experience factor, as you go to get your belief suspended, not to chat. Increasingly, it’s becoming an inconvenient, uncomfortable and expensive experience, that's what the PA survey, along with attendance figures show. Of course, what’s happening is substitution. Broadband, cable, games, internet use are all on the rise. After the plateau in 2002-2005 people shunned the cinema. 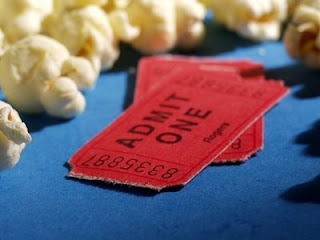 Admissions dropped by 5%, from 164.7m in 2005 to 156.6m in 2006, according to figures from the UK Film Council. Despite the fact that older audiences are proving robust, younger audiences (over half of all cinema goers are under 25) are finding other things to do. This decline among cinema viewing among the young has continued. And this is not a UK problem alone, both the US and Europe experienced a drop in attendance in 2007. And just to rub it in, it also remains to be seen what effect the recession will have on attendance. I'm one of the older age group that still love going to the cinema. 1. Don't own a large flat screen TV. Don't want to. Anyway it oculd never be as big as a cinema screen. 2. No kids coming in during the film demanding X, Y or Z. 3. Likewise no knocks at the door to be answered from uninvited guests. Nor do have to listen to the landline ringing on and on because I am not going to answer it during a film. 4. For me, being part of large crowd experiencing something very funny or dramatic is different to the same experience on my/our own. I can still remember the hysterical laughter in the cinema during the bean eating scene in Blazing Saddles. 5. I find going for a walk and/or a drink afterwards to discuss the film is enjoyable and different to just talking about the film after we have watched it on the TV. The stats suggest that the older audience is the one area that's kept cinema afloat recently. But as majority of audience is under 25therefore not enough growth to do the business. The ecomoinic downturn may mean that only older pensioned people can afford it! It's not a matter of being as big as a cinema screen, merely to match the peripheral vision and quality of film. I agree there's a difference but in the same way that TV overwhelmed the 'theatre' so TV may overwhelm 'film'. I agree with Francis, especially his fourth point. Being in the dark watching a bright screen with other people is an oddly social experience. I believe that is the true benefit of attending a cinema. Sadly the behavior codes that we stuck to in the past are being eroded by an emerging group that feels they must be available to answer their mobile at anytime. On that note I sat behind a young lady who received a call and then went on to describe what was happening in the movie. Where would you start with something like that? Sorry but my english isnt good. I agree whit that list, every point that you mention is correct. Every time is more annoying go to the movies, people dont wanna keep silence in the movie teathers, people dont turn off his cell phone. Piracy its so strong on this days, but that point its because the distribution of movies its not in time. Anyway, I keep going to the movie teather because the experience its unique.